A large number of solar road studs of NK-RS-A6-1 are just produced by NOKIN TRAFFIC FACILITY. the newly produced products are made by aluminum, which is strong than other material, so the solar road stud can be installed in the center of the road for its strong pressure resistance. The solar panel on the road stud can absorb solar energy to provide energy for the road studs. The LEDs on both sides of the solar road stud can give out light of different colors, such as green and red, and the two sides of the road stud can give out two different colors, such as red and orange, or red and white. Green and red can arouse the attention of drivers and pedestrians, and orange and white are more soft for them, which can avoid being tired by seeing the warning colors like red and green. The working pattern of the solar road stud can be changed according to the needs of the customers, and the solar road stud can constantly ON or flashing in certain frequency. The NK-RS-A6-1 is the hot sale product of NOKIN, which is one of the professional road stud suppliers in China. 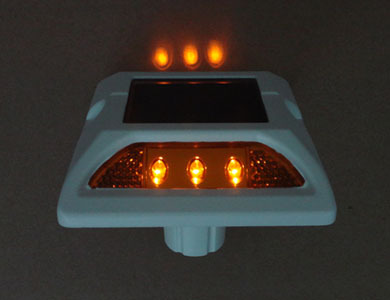 It focuses on the research and development of solar stud and solar road markers in the field of traffic safety facility. NOKIN, who produces solar road studs, solar road signs, amber studs, and other solar products, owns several patents in this field, some of which uses the most advanced technology in the world. Our products are on sale in most countries of the world, and our clients are all satisfied with the quality and outlook of the products. 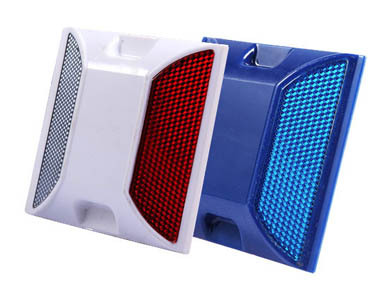 They all say that if they have needs of road reflectors, they will choose the products of NOKIN.